Recently, I've been collecting quite a few Bobbi Brown items. I don't know how it started.. for some reason, BB's base makeup appealed to me. I'm not a huge fan of the color makeup, like the lipstick, powder shadows and gel liners. The lipstick feels sticky, the eyeshadow (from the shimmering nudes palette) oxidize and change color, even with a primer, and the gel liner doesn't stay put. Maybe I just haven't found the right color products yet. I've also tried the hydrating eye cream with avocado, did wow me too much. Now that I think of it, I've tried so many BB products without even realizing it. I recently purchased the Skin Foundation Mineral Makeup in Light to Medium and the Sheer Finish Loose Powder in Soft Sand. I got kind of annoyed at how the Sheer Finish Pressed Powder kept crumbling whenever the hole in the middle grew too big. It happened to both of the BB pressed powders I've used, so I just gave up and purchased the loose one to use at home and I keep a Lancome Translucence pressed powder in my purse instead...hopefully that won't crumble so easily. I haven't actually used the loose powder yet, but it's the same color I've been using in the pressed form, so I can't imagine it being that much different. 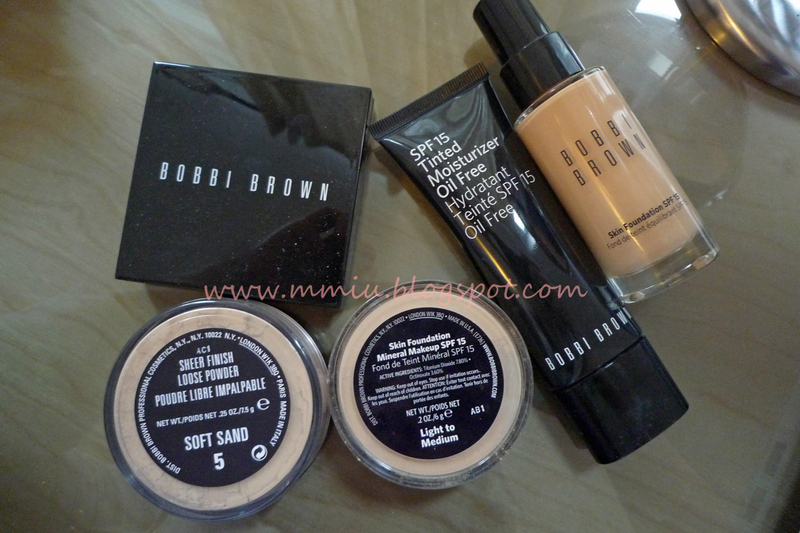 I've done a post of the Skin Foundation and the Tinted Moisturizer in my previous posts if you'd like to read about it. I've read online that the mineral makeup is very sheer but I wanted to try it anyway, and yes it is sheer. When I first applied it, I barely even noticed anything on my skin, but after a few minutes, it seemed to look better and showed some form of coverage. 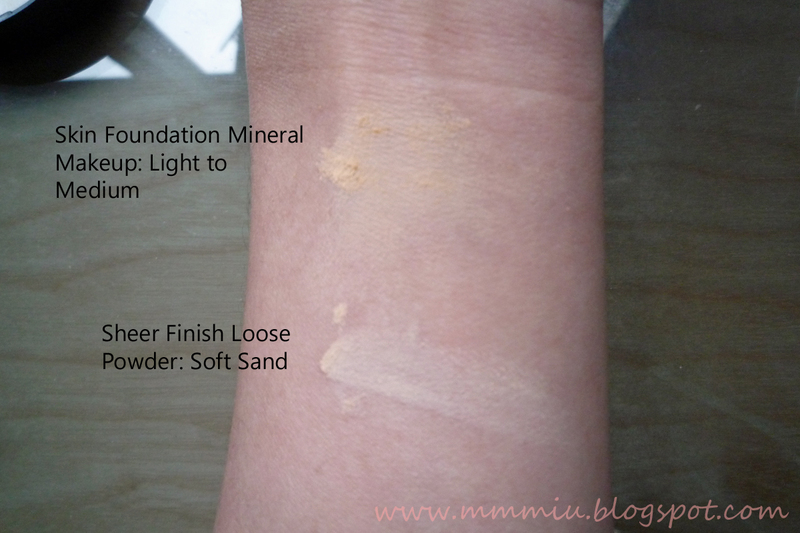 I think it would work well as a finishing powder for those who prefer fuller coverage on top of their foundation. Otherwise it's a great light makeup to use because it stays very natural. It doesn't oxidize on my skin like the Laura Mercier mineral powder, but oil control isn't superior. It's not that my skin looks super oily, but after a couple hours, there's shine on my nose faster than if I used the Lancome Teint Idole Ultra 24 foundation. But overall, I love the feeling of the mineral powder. It's soooo silky and soft and doesn't crease, whereas the Laura Mercier mineral powder, if my forehead gets really oily, I see a bit of it creasing. I'm going to be heading to Port Canaveral in a couple weeks for a 4 day Bahamas cruise, hopefully I'll find some good deals for Bobbi Brown at the outlet mall and duty free store. Totally interested in trying the shimmer bricks. and ease in your mind. It can be employed very easily with its edge cleansing technique and top adjustment features.Cons: Some customers explained this machine is really a small loud. It is absolutely not the noisiest device available but the sounds it creates can even now be a small bothersome.